Do you love a great stripe? 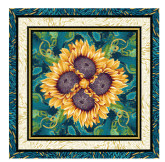 Today Ann Lauer is here with the fabulous sunflower stripe from her Here Comes the Sun fabric collection. She's demonstrating how to cut the stripe to create the pieced stripe blocks that are used in her Steppin' Out quilt pattern. Fussy cutting stripes creates a variety of fun results, but sometimes getting started can be intimidating. 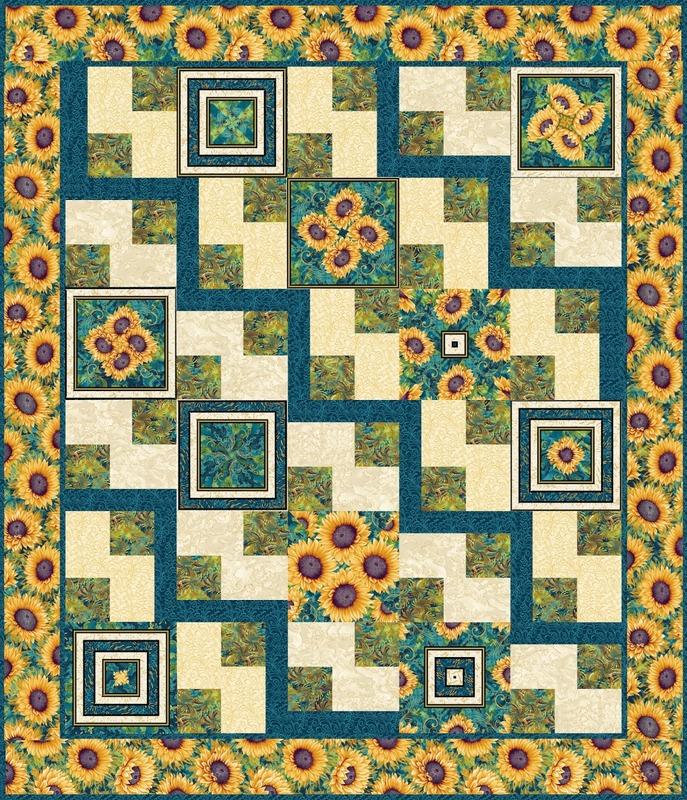 My Steppin’ Out quilt pattern uses blocks made from fussy cut triangles for a unique look. 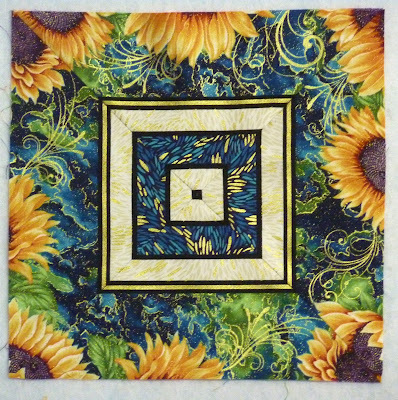 Today I’ll be showing you how to cut the stripe using a quarter square ruler. 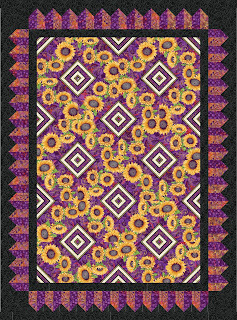 These blocks are addicting to make, and similar to a kaleidoscope, you never know exactly what the next one will look like! 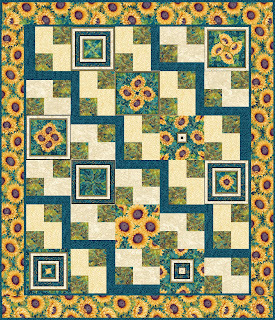 I love using the Here Comes the Sun fabric in these blocks because depending on where you cut your triangles, you’ll have a cluster of sunflowers in the center, around the edges, or maybe even somewhere in between! The stripe-style blocks for Steppin’ Out are cut using a quarter square ruler. 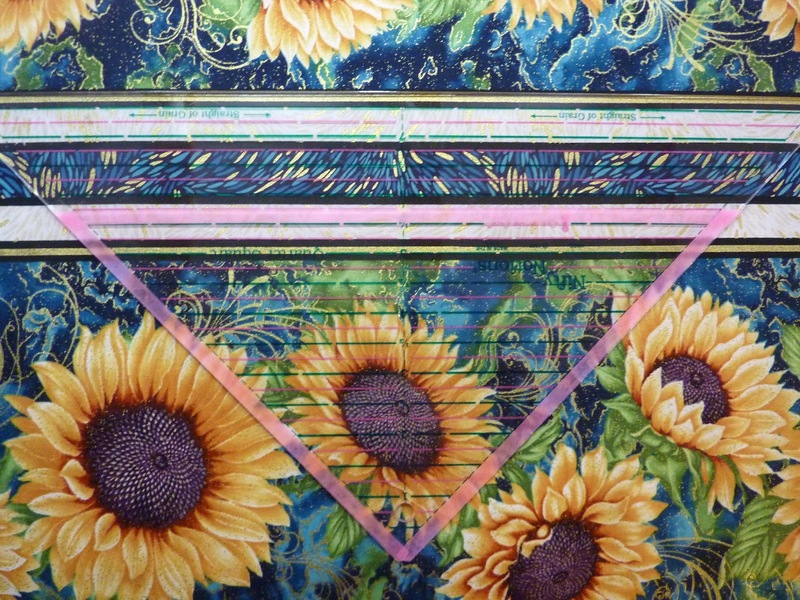 A quarter square ruler has a 90 degree angle at the point of the triangle and 4 triangles will make a square. This can be the Nifty Notions Quarter Square ruler, the Creative Grids 90 Degree Quarter Square Triangle ruler or another ruler like these. 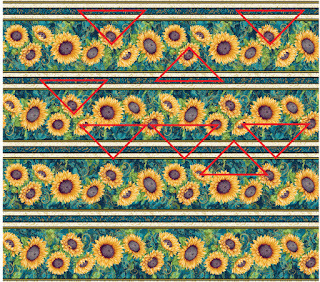 The ruler must have a blunt tip which allows for the ¼” seam allowance. Step 1: Do you remember the old saying, “measure twice and cut once?” We’ll do that first.--double check your size before starting: No matter which ruler you are using, cut (4) 5-1/2” high triangles from scrap fabric and piece them into a square. 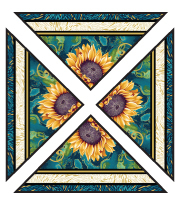 Four triangles should yield a 10 ½” square block, so make any necessary adjustments now. 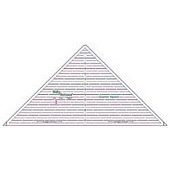 (Note: If the ruler does not have a blunt tip, follow the directions that come with the ruler to determine what size triangles to cut; it will probably be about 5 ¾” high). Step 2: Lay the ruler on the stripe with the 5 ½” line positioned on what you would like to be the outside edge of the 10 ½” block. (Be sure that the registration lines on the ruler are parallel with lines in the stripe.) 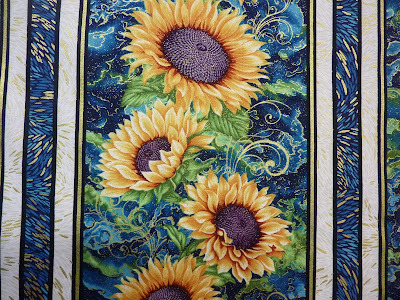 Make a mark with a pen on the fabric on each side of the 5 ½” line. Step 3: Cut along the sides of the ruler. Then slide the ruler so that the straight edge of the ruler is aligned with the marks at the 5 ½” line and cut along the bottom edge of the ruler. 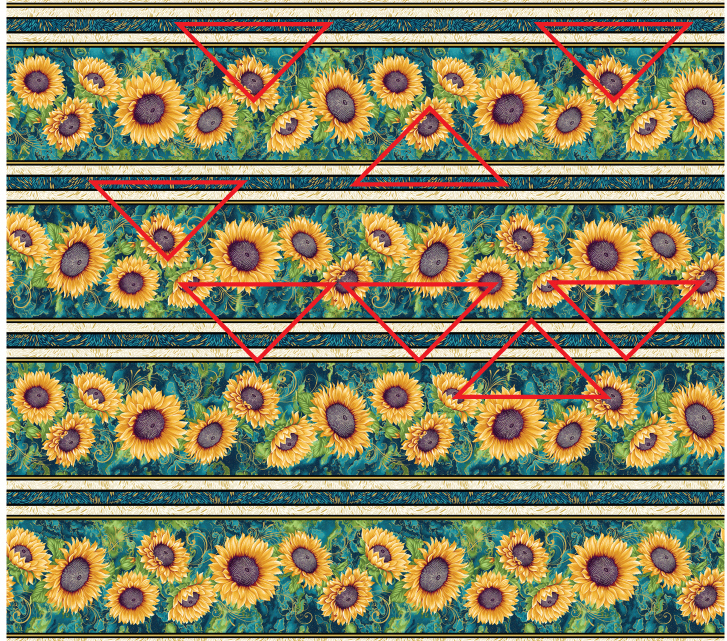 Each block requires 4 triangles cut with the base of the triangle positioned exactly along the same part of the stripe. Tip: You might cut triangles out of paper and lay them along the stripe before you begin cutting to help you plan a layout for the number of triangles you will need for all of the blocks. Also, you could draw them before cutting. 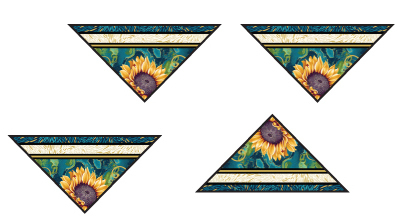 If you center the exact same image in the point of the triangle, you will get a kaleidoscope effect. 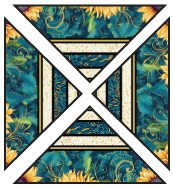 An occasional kaleidoscope block adds nice variety. Step 4: Pin and sew 2 identical triangles together, keeping the ¼” seam accurate to the tip and matching the stripe. Be aware of stretching, since your triangle is cut on the bias. Tip: Using a stylus will help keep the ¼” seams accurate as you sew to the tip. Step 5: Two triangles form half of the block. Sew 2 halves together to make a bock. Press seams in either direction, being careful not to distort the block. 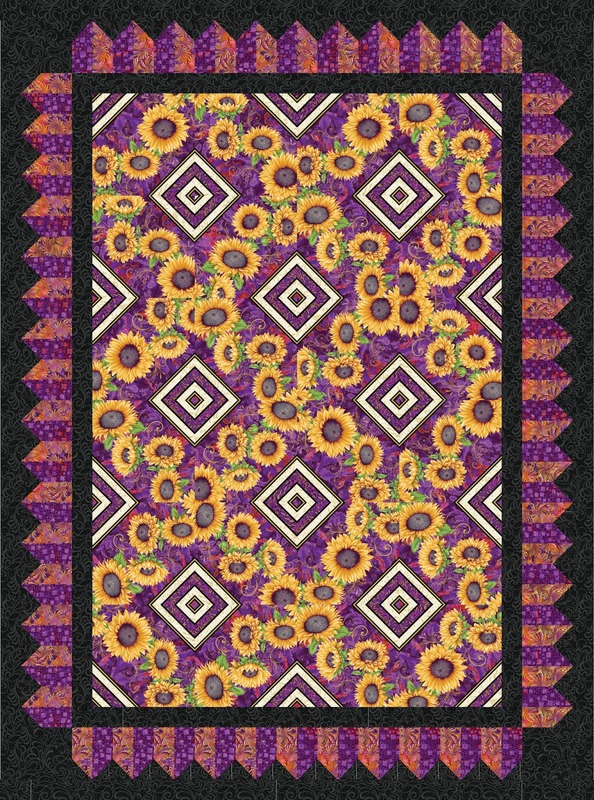 Just for fun, here's a look at Around the Block, another quilt pattern that uses fussy cut squares to create the design. I'll talk more about this pattern later this week. 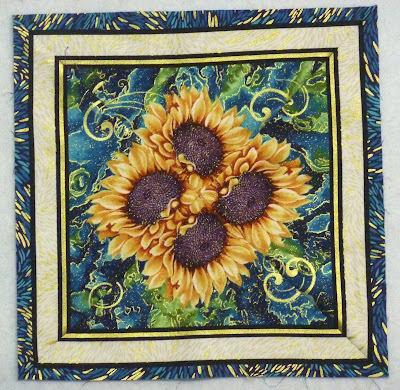 Click here to find Ann's Steppin' Out quilt. Click here to see the entire Here Comes the Sun collection. We want you to show us your stuff! 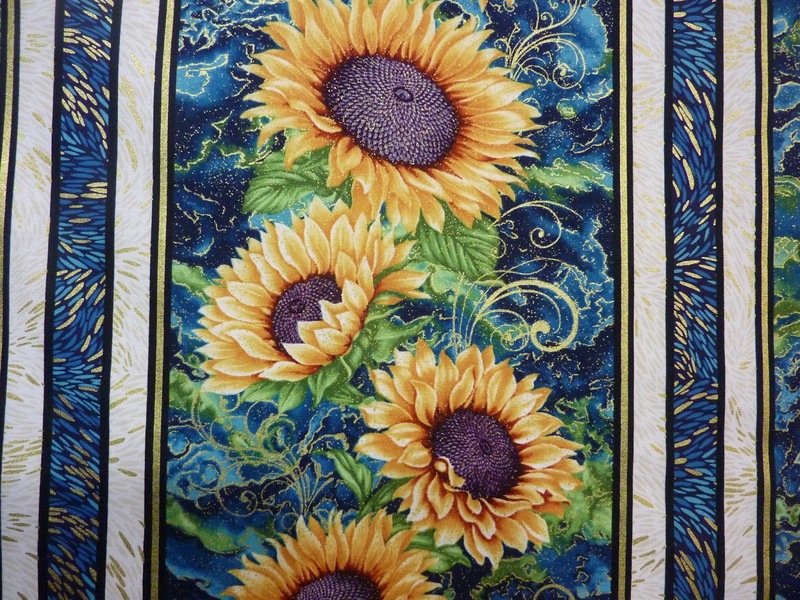 Take a photo of a project you have made using any one of our fabric lines (new or old!) 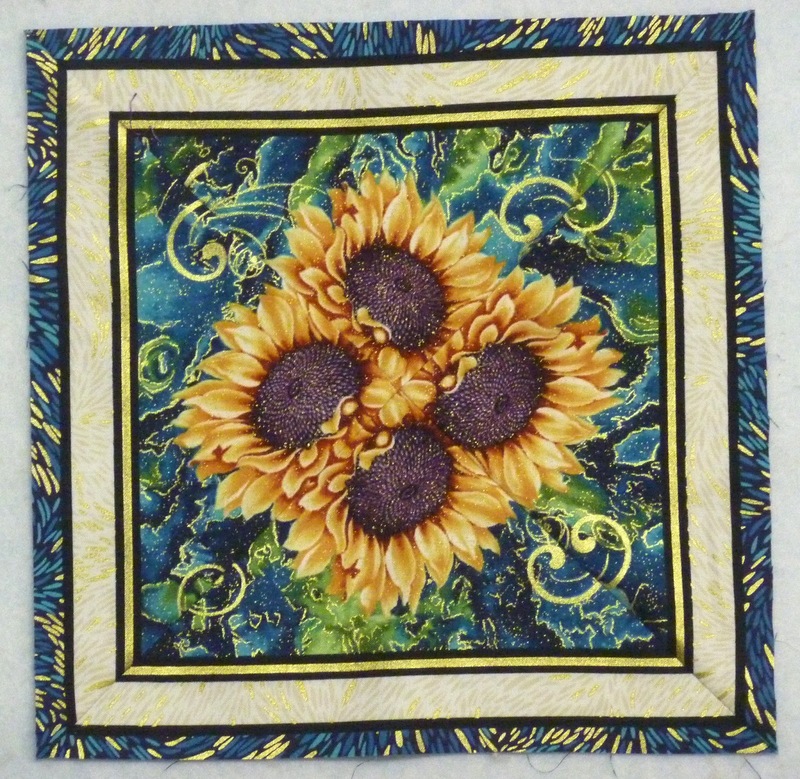 It could be anything from a quilt to a runner to a small project that may not even use sewing at all. 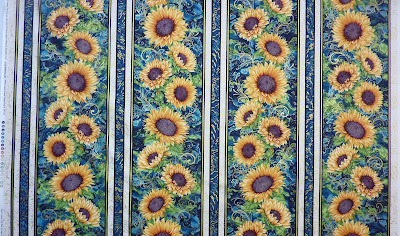 All photographs should accurately display fabrics from Benartex, Kanvas or Contempo. 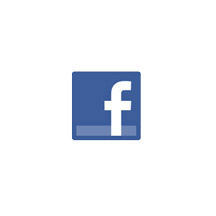 Photo that gets the most likes. 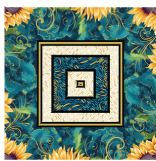 Winner will receive a box filled with assorted FQ bundles for all your quilting and sewing needs. 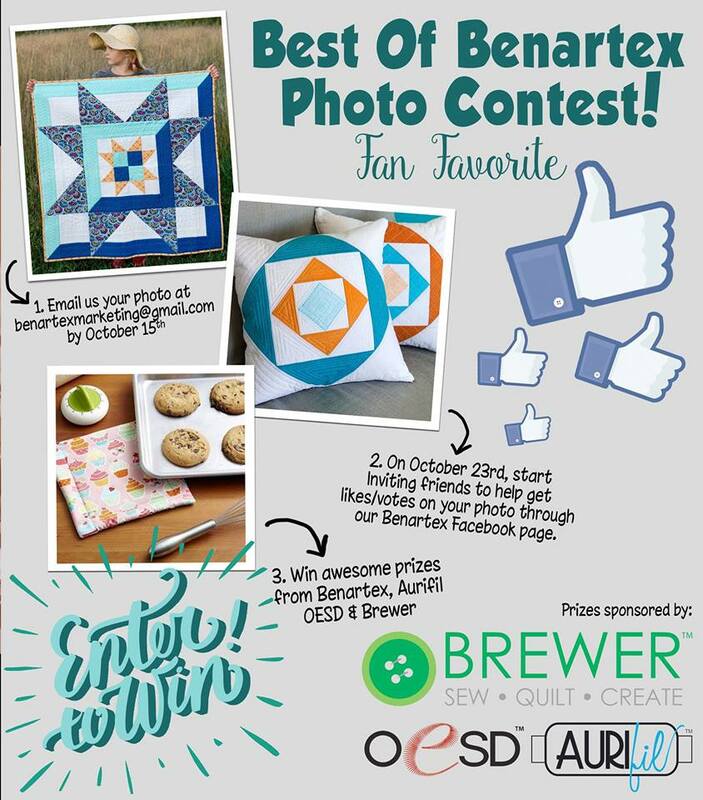 Winner will be selected by members of our Marketing department and will receive a thread and notions prize pack sponsored by AURIFIL, OESD and BREWER. 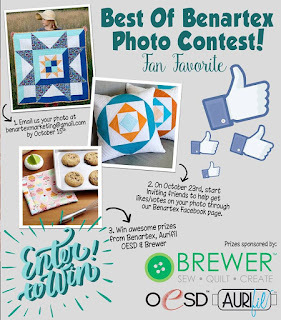 Second place winner for fan votes will receive a thread and notions prize pack sponsored by AURIFIL, OESD and BREWER. The Photo Contest submission entry window is open from 5:00 pm EST on October 2, 2017 until 11:59 pm EST on October 15, 2017. Entries submitted before or after the Entry Period will not be eligible. Voting will begin at 12:00 noon EST on October 23, 2017.